Bus lanes are travel lanes that are restricted to buses during certain hours of the day. All bus lanes have signs posted along the route with specific regulations; lanes are marked "Bus Only" and/or painted red. Bus lanes keep buses from getting stuck in traffic, making travel for bus riders fast and reliable and improving the overall traffic flow of a corridor. There are two types of bus lanes. A curbside bus lane is a travel lane for buses at the curb. Parking and standing at the curb are not permitted during the hours the bus lane is in effect. An offset bus lane is a travel lane for buses one lane away from the curb. This makes parking or standing at the curb still possible. Double parking, or stopping of any kind, is not permitted in an offset bus lane. Unauthorized vehicles may enter a bus lane only to make a right turn at the next city street, to access a curb cut or driveway within 200’, or to quickly drop off or pick up passengers. Unless otherwise restricted, vehicles are permitted to enter the bus lane to make right turns onto the next city street, or to any curb cut within 200′ of the point of entry. To make a right turn from a bus lane, enter the bus lane safely toward the end of the block you are turning from. With an offset bus lane, there are some locations where there is a curbside right turn lane before an intersection. Drivers should merge through the bus lane and use the curbside lane to make their turn, so that they do not block the bus. 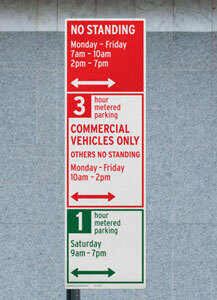 If you are actively in the process of parking, you may cross through the offset bus lane to enter the parking space. Please don’t block buses by waiting in the lane for someone to leave a parking space – you can get a ticket! If possible, arrange your pick up or drop off where there isn't a bus lane – across the street, or on the cross street, for example. However, you may stop in a curbside bus lane for the time it takes for a passenger standing at the curb to enter or a passenger to exit the vehicle and get onto the sidewalk. You cannot pick-up or deliver goods in a bus lane during the hours it is in effect. Many curbside bus lanes have mid-day hours where parking and deliveries are permitted, and many streets with bus lanes have delivery space on an opposite curb, or on a cross street. You can use these hours and locations for deliveries, or schedule the delivery before or after the bus lanes are in effect. If you drive, park, or stand in a bus lane during hours of operation you face fines ranging from $115 to $150. 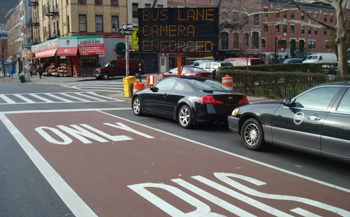 New York State has authorized the City of New York to place cameras along bus lanes to catch violators on selected corridors. Signs are posted along corridors where bus lane cameras are in use to warn drivers to keep out of bus lanes, except for allowed right turns and passenger pick-ups or drop offs. If you have received a bus lane camera violation, you can view the video footage used to issue the violation. 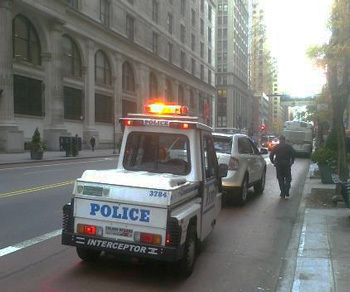 The New York Police Department regularly patrols bus lanes, and issues both moving violations and parking violations to bus lane violators. New York City Transit workers can also enforce bus lanes.